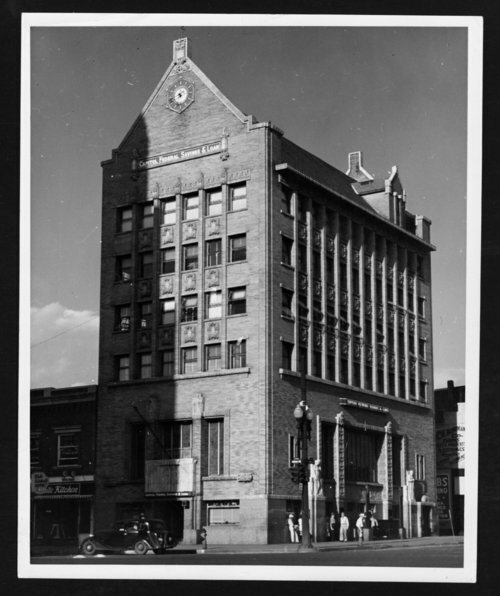 This black and white photograph shows the Capitol Federal Savings & Loan Association building at 534 Kansas Avenue in Topeka, Kansas. Formerly known as the Capitol Building and Loan Association until 1938, this brick structure was considered "an architectural landmark in the Midwest." The architect George Grant Emslie, sculptor Emil Robert Zettler, and muralist John W. Norton designed the building on a theme to "symbolize the Kansas home as a safeguard of liberty and stability." In 1968, the building was demolished.